I've set a Date for the Play day this year! It will be Saturday November 5th this year, So you have ample warning, it may be Hot but start working on those Cars! Sounds perfect! 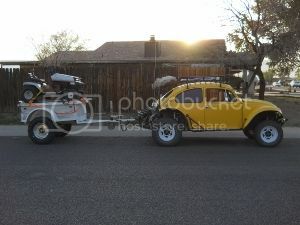 Volkstock is Nov. 12th; AZOP is racing in Gila Bend Nov. 13th. Perfect weekend for some last minute testing before racing! Tony, has an event on the 5th So I guess I will run things this year. With some volunteers I hope. why don't we have this event twice a year? We did that one year by having one in the spring on the east side at Sycamore Creek. I don't see why we cant do it again, Maybe we could call it the AzBaja Spring Fling, scheduled maybe a week or so after the Bug O Rama? its too hot when the bug-o-rama comes around.. end of February or sometime in March. looks like JWH gets the Tee shirt logo. once again... awesome work Tony. Emails sent out. I know several companies will step up and help out again this year. Going to be another great weekend in the desert. I have heard back from several sponsors already. When things start to show up I will let everyone know. Just an FYI - Box at the front door this morning. Didn't have a chance to see who it is from, but the donations are coming in. Will update when I get a chance. Great idea. Do it as a reverse limbo. Start at 2 feet and work your way up. . .
[ Go to page: 1,	2	] 18 Dirtjunkie 6747 AzBaja Playday 2017?